In October 2015, Google announced the introduction of the Accelerated Mobile Pages (AMP) project, an open-source project aiming to “dramatically improve the performance of the mobile web”. The project has now finally launched, taking a big stride towards Google’s goal to provide users with a “better, faster mobile internet”. But what exactly is AMP and how will it alter the experience of the mobile web? We’ll explain what AMP is, how it works and how you can implement it to speed up your website and get to the top of the search results. 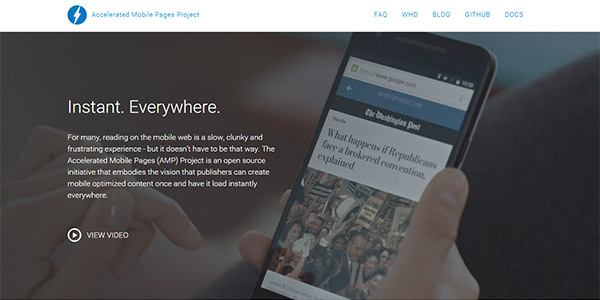 Accelerated Mobile Pages, or AMP for short, is a Google-backed project that aims to deliver content on the mobile web four times faster and using less data than traditional pages. With an increasing number of users browsing the web using mobile devices, the need for a speedier mobile web has increased as well. So AMP is intended as an open standard for any site owner that wants to have speedy, lightweight pages that load in a second or two. Google boasts that a page created with AMP HTML can load anywhere from 15 to 85% faster than the non-AMP version of that page. How is that possible? AMP are served via Google’s CDN (Content Delivery Network), which means that users are connecting to a server that is close to their geographical location, which eliminates the possibility of network delays. Also, when users are on the search results page, the AMP are pre-fetched, which means that when users tap on them, the pages load faster than other links. AMP is primarily aimed at publishers and sites with lots of content like news, articles, blog posts. With this project, Google wants to help publishers deliver “lightning-speed” content to mobile users. Google’s search algorithm is designed to favour websites that provide a good user experience. But what does that mean exactly? It means a site that is mobile-friendly and loads fast. Responsive sites are designed to help deliver content and display pages properly on any device, from a desktop computer to a mobile phone. So the focus here is on flexibility. However, responsive design often fails miserably on speed. AMP, on the other hand, focuses on speed and on delivering content instantly to the mobile user. Another difference between AMP and responsive web design is that while AMP can work with an existing site, without having to do a complete site redesign, with responsive design the site owner needs to replace their existing site. Now, another thing to consider is that AMP currently only works with static content so it’s best used for sites with news articles, blog posts and informational content while responsive design is better equipped for things like custom applications and web forms. How will AMP impact organic and paid search? AMP results appear as a carousel of swipeable images at the top of the search results, pushing organic results down, and even replacing paid ads. This shows the importance Google is putting on the AMP project. Also, since page speed is already a factor in Google results, faster pages will obviously get preference. So the immediate impact for publishers that don’t opt into AMP will be a decrease in visibility in the search results, which will result in fewer impressions and clicks. Since organic results are pushed below the fold, and if you throw paid search ads into the mix, users will need to scroll way down to get to the traditional organic listings. This means that sites that want to stay competitive will need to opt into AMP. When it comes to paid search, things aren’t quite clear. Since AMP focuses on content like news articles, blog posts and any other type of informational content, it’s likely that AMP will appear on general terms that will have fewer paid search advertisers on them. Google will need to work to weigh user intent and relevancy when its algorithms determine how and when the AMP module is displayed. CSS is also strictly limited in AMP HTML. Among the banned are the most common CSS properties used for animation. Also, while custom fonts are allowed, there are some constraints here as well. You can embed things in an AMP page, but you’ll need to use pre-approved extensions like amp-youtube and amp-twitter. You also won’t be able to build interactive maps or data visualizations in AMP. 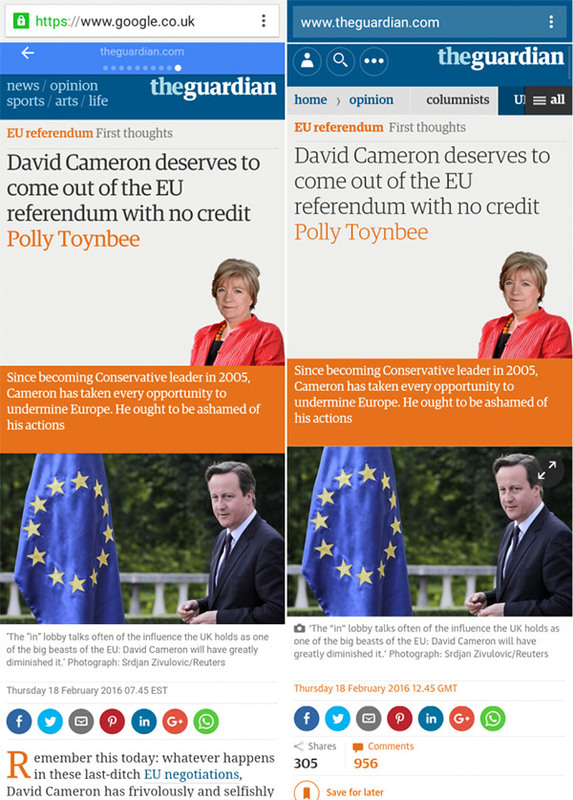 So AMP makes sense for sites with articles, blog posts or journalistic content. Since this is an open source project, Google has made all the code available on GitHub. They’ve also provided a step-by-step tutorial that explains how to create a basic AMP HTML page, how to stage it and validate its AMP compliance. For those using WordPress, there’s also an easy to install plugin that helps enable AMP on a WordPress website. There is an AMP validator that comes with the JS library. Read the AMP guide for more details. This post from SEO Skeptic includes useful information on how to markup your articles for AMP pages. The Google Structured Data Testing Tool also includes a filter for “AMP Articles” that returns warnings and errors for non-compliant markup. You can access this report in the Google Search Console for webmasters. AMP will not only improve site speed but it also has the potential to change content consumption behaviours for mobile users. There aren’t any major reasons why publishers shouldn’t opt into AMP. On the other side, if they choose not to, they’ll be missing out on a significant amount of traffic. Implementation is simple and Google has already provided lots of useful tutorials and resources to make it easy for publisher to adopt and implement it. What do you think about Google’s AMP project? Will you be adding it to your website?